Our Red Box is OUT OF STOCK, but we have ordered more! You are still able to purchase it now and we will ship it to you as soon as it arrives. Questions? Please call 1-800-438-5346 or email us at info@Lehmans.com. Keep your homemade bread fresh for suppertime with this classic bread box. 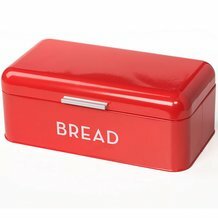 Wide hinged lid swings up for easy access to your bread and baked goods. 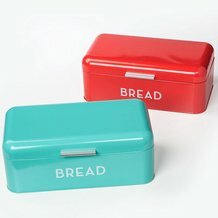 And with its vintage colors and style, it makes a charming addition to any counter. 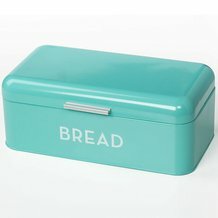 Love my turquoise bread box. It is a very retro-Mad Men addition to my 1919 kitchen. Also, your packaging was awesome. No chance of any scratches with your company! !